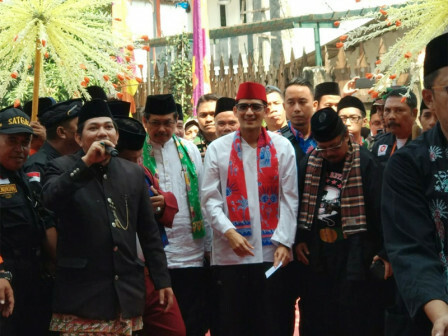 Jakarta Vice Governor, Sandiaga Uno opens Lebaran Betawi event at Setu Babakan, Jagakarsa, South Jakarta.
" Palang Pintu is performed to welcome Vice Governor"
His arrival is welcomed with Palang Pintu performance. Sandi has arrived at the locations at 10.30 AM by wearing white Sadariah clothes and red sarong. Five mayors are also attending this event. On the location, he looks enthusiastic when watching Palang Pintu performance which is played by one of Betawi clubs. At least there are three people perform martial arts in front of Sandi and other visitors. Setu Babakan Betawi Cultural Village (PBB)'s Management Unit Administration Head, Syaiful Amri stated, Palang Pintu tradition is used to be performed in welcoming honor guest in traditional wedding ceremony. "Palang Pintu is performed to welcome Vice Governor," he conveyed, Saturday (7/28). He explained, it is the 11th time Lebaran Betawi is held. While it is the second time for Setu Babakan to be used to celebrate Lebaran Betawi. "The peak event will be held tomorrow and attended by governor. While this event is opened by vice governor," he said.